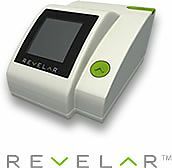 Revelar provides the first accurate aldehyde measurement system that both detects and measures aldehydes in the breath. Aldehydes are known to be indicators of free radical damage also known as oxidative stress. External factors, such as diet, activity, stress, chemicals and pollutants cause our bodies to produce excess free radicals that damage healthy cells. This can lead to heart disease, cancer and rapid aging. To limit the effects of free radical damage, millions of Americans take antioxidant supplements, making such supplements a multi-billion dollar industry. Studies have shown that the right antioxidants and regimen may help the body to effectively process free radicals and reduce damage to healthy cells. But because of the differences in our bodies and inaccurate information in the market, we do not know which antioxidant supplements really work to effectively reduce free radical damage. We need an accurate way to measure the effectiveness of an antioxidant regimen. Revelar provides unprecedented accuracy in measuring aldehydes, a known by-product of free radical damage. The presence and quantity of aldehydes is known to cause free radical damage, resulting in cell damage. Revelar works via the breath, a matrix that uniquely contains multiple aldehydes. The previous gold standard, the TBARS blood test, measured only one aldehyde. Measuring and monitoring the multiple aldehydes detected by Revelar is an important indicator that can help patients obtain tangible feedback. The Recovery DOC team uses Revelar to monitor the aldehyde levels in our athletes. This allows us to have a benchmark to measure improvements and monitor progress for lowering.